Name Variation Mary Schnuettgen was also known as Schnuttgen. Married Name circa 1913 As of circa 1913,her married name was Wortmann. Mary Schnuettgen was born circa 1887 at Iowa. She married Anton J. Wortmann circa 1913. [S250] U.S. Federal Census 1930 U.S. Federal Census, by Ancestry.com, Year: 1930; Census Place: Precinct 8, Cedar, Nebraska; Roll: 1268; Page: 3B; Enumeration District: 11; Image: 496.0. Rudolph J. Wortmann was born on 17 July 1920 at Nebraska. He was the son of Anton J. Wortmann and Mary Schnuettgen. service was held later that evening at Holy Trinity Catholic Church, Hartington. Funeral services were Jan. 22 at Holy Trinity Catholic Church with Rev. Foresters, Hartington VFW Post #5283 and the Disabled American Veterans. He was also a Fourth Degree Knight in the Knights of Columbus. Survivors include his wife, Anna, Hartington; nine children and their spouses, Roger and Sherry Wortmann, Hartington; Mary Jean and Richard Stefanec, Tarzana, Calif; Louann and Gary Gard, Chesapeake, Va; Dennis and Deb Wortmann, North Platte; Jolene and Robert Fleissner, Omaha; Rita and Joe Craig, Omaha; Loren and Mary Ann Wortmann, Hartington; Gerard "Gary" and Joan Wortmann, Hartington; Carol and Tim Craig, Hartington; three sisters, Elvira Kathol, Bow Valley; Mrs. Edgar (Theodora) Wuebben, Wynot; Mrs. John (Josephine) Olinger, Sioux Falls, S.D; two brothers, Rev. Edgar Wortmann, Omaha, and Francis Wortmann, Hartington; 39 grandchildren and four great-grandchildren. Eleanor Pinkelman; and a granddaughter, Michelle Wortmann. Memorials preferred to Cedar Catholic Endowment Fund. Married Name Her married name was Wuebben. Theodora Wortmann married Edgar J. Wuebben. Theodora Wortmann was born circa 1919 at Nebraska. She was the daughter of Anton J. Wortmann and Mary Schnuettgen. Edgar J. Wuebben married Theodora Wortmann, daughter of Anton J. Wortmann and Mary Schnuettgen. Edgar J. Wuebben was born on 25 November 1917. He died on 4 November 2009 at age 91. Rev. Edgar Wortmann was born on 12 July 1922 at Nebraska. Rev. Edgar Wortmann died on 31 August 2007 at age 85 Monsignor Edgar J. Wortmann, 85, Omaha, died Aug. 31, 2007, at Blessed Sacrament Catholic Church, Omaha. Visitation and a Vigil Service in Omaha were Sept. 4 at Blessed Sacrament Catholic Church. Mass of Christian Burial in Omaha will be Sept. 5, at 10:30 a.m., at Blessed Sacrament Catholic Church. Visitation at Holy Family (Sts. Peter and Paul) Catholic Church, Bow Valley, will begin Sept. 5, at 6:30 p.m., with a Vigil Service at 7:30 p.m.
Memorial Mass of Christian Burial, Bow Valley, will be Sept. 6, at 10:30 a.m., at Holy Family Catholic Church, Bow Valley. Monsignor Edgar J. Wortmann was born July 12, 1922, in Bow Valley, to Anton Joseph and Mary (Schnuettgen) Wortmann. He grew up in the Bow Valley area and was baptized, received First Communion, and was confirmed in Sts. Peter and Paul Catholic Church. He graduated from Holy Trinity High School, Hartington, as valedictorian in 1940. He graduated from Trinity College, Sioux City, Iowa, in 1944. His seminary training was at Kenrick Seminary, St. Louis, Mo. He was ordained at St. Cecilia Cathedral, Omaha, April 5, 1948. His first assignment as an associate pastor was at St. Ludger’s, Creighton, until 1952 and at St. Bernard’s, Omaha, for a couple years. He was assigned to Blessed Sacrament, Omaha, from 1953-1956. He was pastor at Holy Family, Decatur, for two and one half years, then at St. Rose of Lima, Hooper, and St. Lawrence, Scribner, before becoming pastor of Blessed Sacrament Catholic Church, Omaha, since 1972. In July of 1989, Msgr. Wortmann was presented the Boys Town Distinguished Service Award. In 1994, he received the Outstanding Religious Service Person Award for exceptional efforts in the field of Catholic Education in the Archdiocese of Omaha. He was given the title of monsignor by Pope John Paul II in 2003. Msgr. Wortmann was the oldest active priest in the Omaha Archdiocese. Monsignor Wortmann was referred to as “an absolute hero for Catholic education in northeast Omaha.” He worked hard to find ways to make a private, Catholic education affordable for children. He also worked as the moderator for the National Council of Catholic Women since 1969. Monsignor is survived by his brother and spouse Francis and Irene Wortmann, Hartington; three sisters, Elvira Kathol, Bow Valley; Theodore and her husband, Edgar Wubben, Wynot; and Josephine and her husband, John Olinger, Sioux Falls, S.D; sister-in-law, Anna Wortmann, Hartington, and many nieces and nephews. Monsignor was preceded in death by his parents, Anton and Mary; brothers, Rudolph and Augustine; and sister, Eleanor Pinkelman. Name Variation August Wortmann was also known as Augustine. August Wortmann was born circa January 1927 at Nebraska. August Wortmann died before 1999. Married Name Her married name was Pinkelman. Eleanor Wortmann was born circa 1917 at Nebraska. Eleanor Wortmann died before 1999. Jean Marie Wortmann was the daughter of Rudolph J. Wortmann. Jean Marie Wortmann died before 1999. John Paul Tramp was born on 30 September 1944 at South Dakota. He was the son of Louis Tramp and Mary H. Goeden. John Paul Tramp died on 5 May 2007 at age 62 John Paul Tramp, 62, Crofton, died May 5, 2007, at Avera Sacred Heart Hospital, Yankton, S.D. Visitation, with a vigil Service, was May 7 at St. Rose of Lima Catholic Church, Crofton. Arrangements are under the direction of the Wintz Funeral Home, Crofton. Mass of Christian Burial will be May 9, at 10:30 a.m., at St. Rose of Lima Catholic Church, Crofton, with the Rev. Joseph Broudou officiating. Burial will be at the Beaver Creek Cemetery, rural Crofton. Pallbearers will be Jason Tramp, Craig Bruening, Kevin Bruening, Chris Bruening, Bryan Bruening and Mitchell Bruening. John Paul Tramp was born Sept. 30, 1944, in Yankton, S.D., to Louis and Mary (Goeden) Tramp. He attended St. Rose of Lima grade school and Crofton High School. He married Sharon Marie Bruening May 18, 1968, at Immaculate Conception Catholic Church, St. Helena. John farmed and did carpentry work until 1973, when he went into full-time farming and cattle feeding. He received a kidney transplant in September 2004. John enjoyed golfing, playing cards, hunting and fishing. He loved his home by the lake with all the wildlife and doing things with his family. He was a member of St. Rose of Lima Catholic Church. John is survived by his wife, Sharon, Crofton; two sons, Jeff and Justin Tramp, Crofton; one brother and spouse, Jim and Jean Tramp, Yankton, S.D; one sister and spouse, Anita and Tom Massey of Las Vegas, Nev; brother-in-law, Joe Kneifl, Sulfur Springs, Texas; and several nieces and nephews. He was preceded in death by his parents, Louis and Mary Tramp; and one sister, Marietta Kneifl. Married Name Her married name was Kneifl. Marietta Tramp was the daughter of Louis Tramp and Mary H. Goeden. Marietta Tramp died before May 2007. Name Variation Marion Graham Dickie was also known as Dickey. Name Variation Marion Graham Dickie was also known as Marian. Married Name circa 1927 As of circa 1927,her married name was Clark. Marion Graham Dickie was born on 14 December 1907 at Wentworth, Ontario, Canada. She was the daughter of Mitchell Dickie and Isabella Patterson. Marion Graham Dickie married Francis Edward Clark, son of Harvey Clark and Pearl Viola Nash, circa 1927. Marion Graham Dickie died on 13 July 1988 at San Bernardino, California, at age 80. [S244] U.S. Federal Census 1910 U.S. Federal Census, by Ancestry.com, Year: 1910; Census Place: Detroit Ward 8, Wayne, Michigan; Roll: T624_683; Page: 4B; Enumeration District: 0111; Image: 515; FHL Number: 1374696. [S243] U.S. Federal Census 1920 U.S. Federal Census, by Ancestry.com, Year: 1920;Census Place: Greenfield, Wayne, Michigan; Roll: T625_801; Page: 14A; Enumeration District: 695; Image: 426. [S250] U.S. Federal Census 1930 U.S. Federal Census, by Ancestry.com, Year: 1930; Census Place: Los Angeles, Los Angeles, California; Roll: 154; Page: 15A; Enumeration District: 578; Image: 1024.0. [S373] U.S. Federal Census 1940 U.S. Federal Census, by Ancestry.com, Year: 1940; Census Place: Los Angeles, Los Angeles, California; Roll: T627_431; Page: 4A; Enumeration District: 60-1256. Name Variation Francis Edward Clark was also known as Frances Edward. Francis Edward Clark was born on 7 July 1900 at Gentry, Missouri, also reported as 7 Jun 1901. He was the son of Harvey Clark and Pearl Viola Nash. Francis Edward Clark married Marion Graham Dickie, daughter of Mitchell Dickie and Isabella Patterson, circa 1927. Francis Edward Clark died on 17 February 1970 at Rialto, San Bernardino, California, at age 69. He was buried after 17 February 1970 at Green Acres Memorial Park and Mortuary, Bloomington, San Bernardino, California. Francis Edward Clark was a truck driver for oil company (Texaco) in 1930. [S244] U.S. Federal Census 1910 U.S. Federal Census, by Ancestry.com, Year: 1910; Census Place: Colton, San Bernardino, California; Roll: T624_93; Page: 5B; Enumeration District: 0094; Image: 1019; FHL Number: 1374106. [S243] U.S. Federal Census 1920 U.S. Federal Census, by Ancestry.com, Year: 1920;Census Place: Los Angeles Assembly District 71, Los Angeles, California; Roll: T625_111; Page: 17B; Enumeration District: 312; Image: 1067. Frank Carl Schwanke was born on 15 July 1897 at Wisconsin also reported as Jul 1896. He was the son of Charles Schwanke and Anna Kalsow. Frank Carl Schwanke married Fanny M. Wilkinson, daughter of William Wilkinson and Fanny Maria Jeffcott, on 5 November 1918. 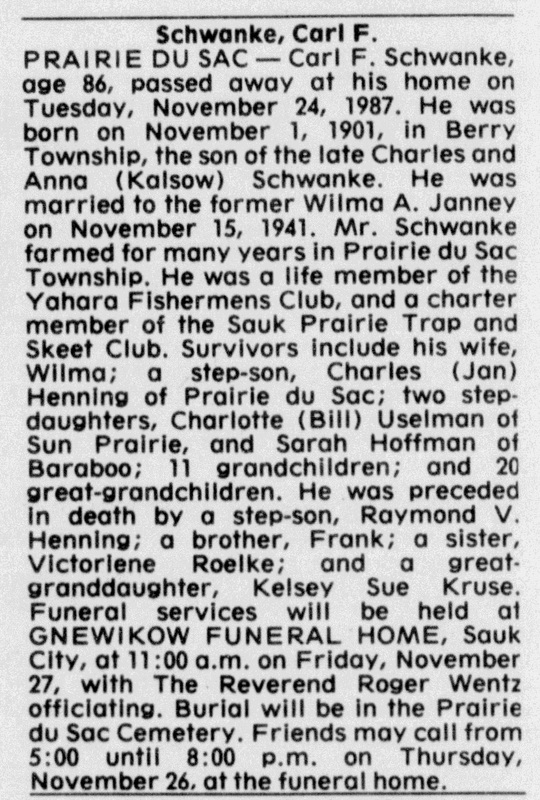 Frank Carl Schwanke died on 16 August 1987 at age 90 Frank C Schwanke, 90, obituary. 1 June 1905 Mazomanie, Dane, Wisconsin Frank Carl Schwanke appeared on the census of 1 June 1905 in the household of Charles Schwanke at Mazomanie, Dane, Wisconsin. Frank Carl Schwanke obtained US Social Security Card at Wisconsin; last residence Sauk City, Sauk, Wisconsin. On 24 August 1918 at World War I Draft Registration, Dane, Wisconsin. [S245] U.S. Federal Census 1900 U.S. Federal Census, by Ancestry.com, Year: 1900; Census Place: Mazomanie, Dane, Wisconsin; Roll: T623_1783; Page: 3A; Enumeration District: 57. [S244] U.S. Federal Census 1910 U.S. Federal Census, by Ancestry.com, Year: 1910; Census Place: Mazomanie, Dane, Wisconsin; Roll: T624_1708; Page: 14A; Enumeration District: 0076; Image: 488; FHL Number: 1375721. [S243] U.S. Federal Census 1920 U.S. Federal Census, by Ancestry.com, Year: 1920;Census Place: Mazomanie, Dane, Wisconsin; Roll: T625_1982; Page: 11B; Enumeration District: 68; Image: 154. [S250] U.S. Federal Census 1930 U.S. Federal Census, by Ancestry.com, Year: 1930; Census Place: Mazomanie, Dane, Wisconsin; Roll: 2567; Page: 1B; Enumeration District: 54; Image: 896.0. Name Variation Fanny M. Wilkinson was also known as Fannie M.
Married Name 5 November 1918 As of 5 November 1918,her married name was Schwanke. Fanny M. Wilkinson was born on 24 July 1896 at Illinois. She was the daughter of William Wilkinson and Fanny Maria Jeffcott. 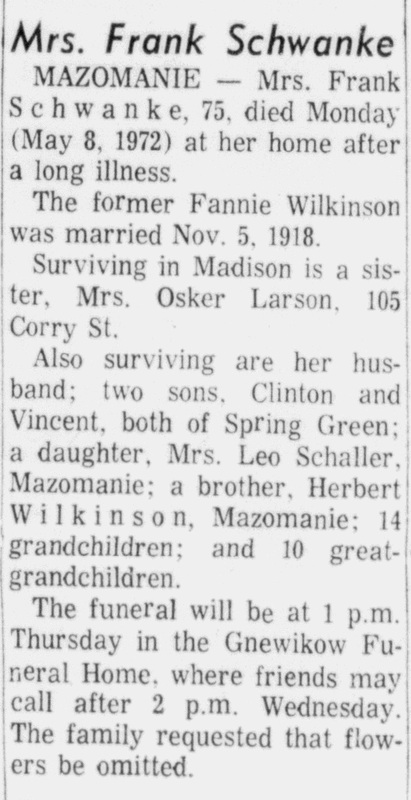 Fanny M. Wilkinson married Frank Carl Schwanke, son of Charles Schwanke and Anna Kalsow, on 5 November 1918. 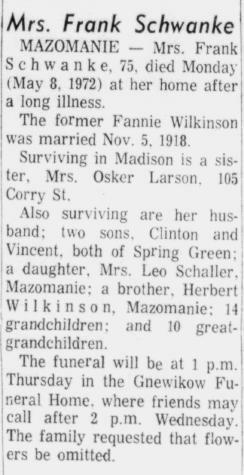 Fanny M. Wilkinson died on 8 May 1972 at Mazomanie, Dane, Wisconsin, at age 75 Mrs Frank Schwanke (Fannie Wilkinson) obituary. Fanny M. Wilkinson obtained US Social Security Card at Wisconsin; last residence Mazomanie, Dane, Wisconsin. [S245] U.S. Federal Census 1900 U.S. Federal Census, by Ancestry.com, Year: 1900; Census Place: Chicago Ward 21, Cook, Illinois; Roll: T623_271; Page: 2A; Enumeration District: 639. [S244] U.S. Federal Census 1910 U.S. Federal Census, by Ancestry.com, Year: 1910; Census Place: Mazomanie, Dane, Wisconsin; Roll: T624_1708; Page: 14B; Enumeration District: 0076; Image: 489; FHL Number: 1375721. 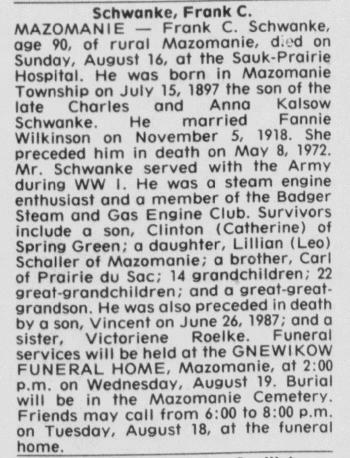 Name Variation Clinton F. Schwanke was also known as Clint. 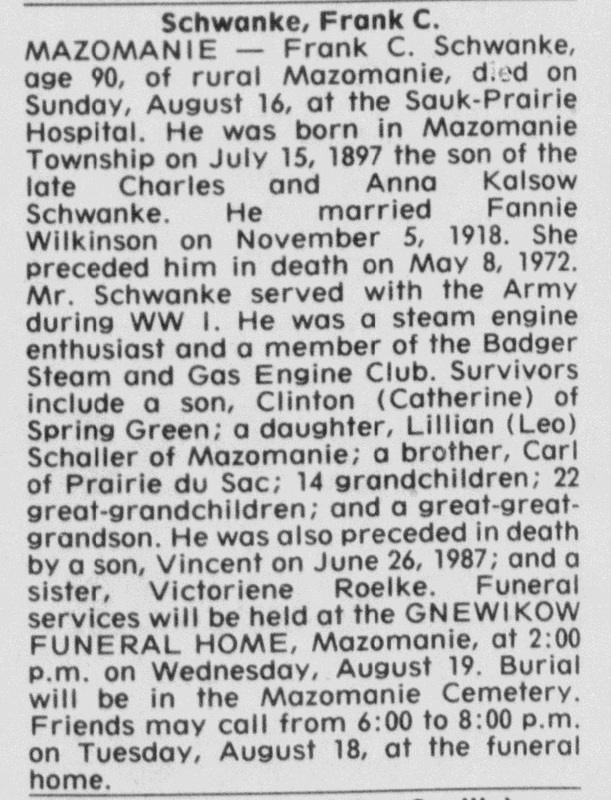 Clinton F. Schwanke was born on 12 April 1923 at Wisconsin. He was the son of Frank Carl Schwanke and Fanny M. Wilkinson. Clinton F. Schwanke married Catherine Lorraine Emery, daughter of Dewitt Clinton Emery and Laurelda Marcella (? ), on 18 June 1946. Clinton F. Schwanke died on 15 June 2007 at age 84 Clinton F. Schwanke, age 84, of Spring Green, passed away Friday, June 15, 2007, at his home from cancer. He was born on April 12, 1923, in Mazomanie, the son of Frank and Fanny (Wilkinson) Schwanke. Clinton married Catherine "Katie" Emery on June 18, 1946, in Sauk City. He was co-owner of Sew-n-Sew in Spring Green. Survivors include wife, Katie Schwanke of Spring Green; daughters, Sandy Neal of Madison, Jeanie (Chuck) Hadden of Sun Prairie, Kathy (Denny) Muskat of Middleton, ZoAnn (Isa) Bashir of Sokoto, Nigeria and Barb (Brett) Kleppe of Madison; sister, Lillian Schaller of Mazomanie; grandchildren, Mark (Monique Lomax) Neal, Yvette Neal, Todd (Colleen) Hanson, Angela Bahr, Rebecca Hanson, Ishmael Bashir, Ben Kleppe and Katie (Jeff Jossart) Kleppe; step-grandchildren, Matt (Kim) Hadden, Sarah Hadden and Kerry Hadden; six great-grandchildren; and many other nieces, nephews, other relatives and friends. Clinton was preceded in death by his parents; brother, Vince; and son-in-law, Brazie Neal. He enjoyed hunting, fishing, gardening and spending time with his family and friends. A memorial service will be held on Tuesday, June 19, 2007, at 11 a.m. at RICHARDSON-STAFFORD FUNERAL HOME in Spring Green, with Pastor Rick Walker officiating. Online condolences available at staffordfuneralhomes.com. A special thank you to nephew and wife, Jim and Linda Schwanke; granddaughter, Becky; Dr. Scott Ensminger and staff at Sauk Prairie Hospital, Dr. Charles Diggs, Dean Oncology in Madison, Turville Bay Radiation Oncology Center of Madison, Hospice Home Care Staff-Natalie, Sue, Carol and Shirley, the Richardson-Stafford Funeral Home and the Spring Green Police Department. In lieu of flowers, memorials may be made to Home Health Hospice of Sauk County. Richardson-Stafford Funeral Home Spring Green. Name Variation Charles Schwanke was also known as Charlie. Charles Schwanke was born on 4 November 1869 at Germany also reported as Nov 1868. He married Anna Kalsow in March 1895. Charles Schwanke died in 1958. 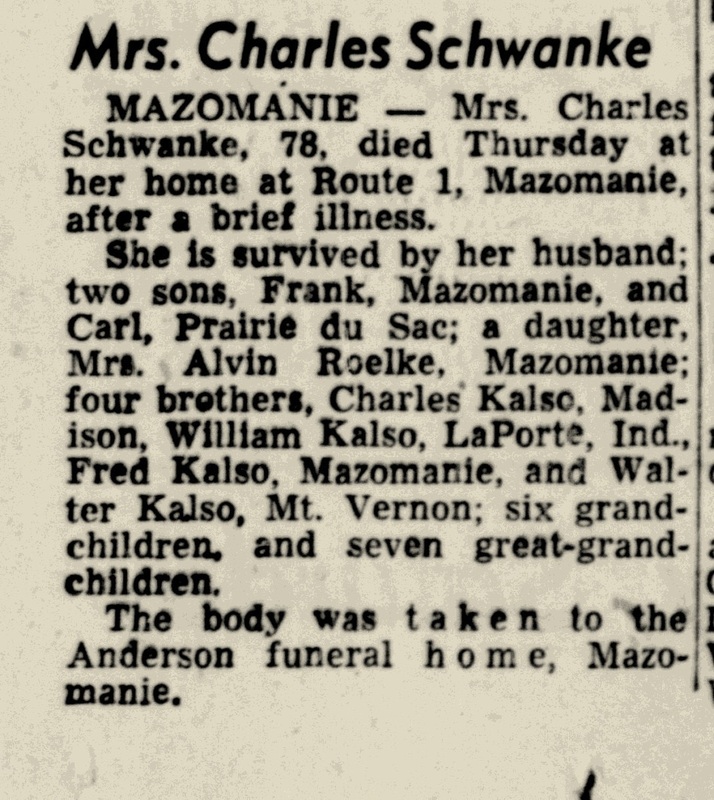 20 June 1895 Mazomanie, Dane, Wisconsin Charles Schwanke appeared on the census of 20 June 1895 at Mazomanie, Dane, Wisconsin, reported 1 male and 1 female; both born in Germany. 1 June 1905 Mazomanie, Dane, Wisconsin He appeared on the census of 1 June 1905 at Mazomanie, Dane, Wisconsin. Charles Schwanke immigrated in May 1875 to New York, New York, also reported as 1876. He was naturalized on 20 January 1919 at Circuit Court, Madison, Dane, Wisconsin. In March 1950 Charles and Anna (Kalsow) Schwanke 55th wedding anniversary celebration. Married Name March 1895 As of March 1895,her married name was Schwanke. Anna Kalsow was born in May 1875 at Germany. She married Charles Schwanke in March 1895. Anna Kalsow died on 21 February 1952 at Wisconsin at age 76 Mrs Charles Schwanke (Anna Kalsow) obituary. 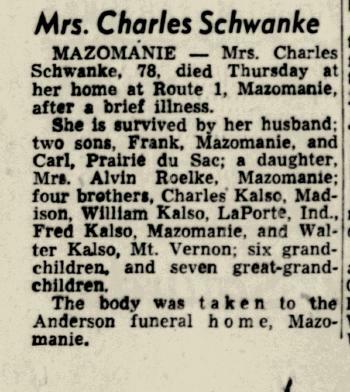 20 June 1895 Mazomanie, Dane, Wisconsin Anna Kalsow is counted on the census of 20 June 1895 in the household of Charles Schwanke at Mazomanie, Dane, Wisconsin; reported 1 male and 1 female; both born in Germany. 1 June 1905 Mazomanie, Dane, Wisconsin Anna Kalsow appeared on the census of 1 June 1905 in the household of Charles Schwanke at Mazomanie, Dane, Wisconsin. Anna Kalsow immigrated in 1883. She had 1 with 1 living in 1900 children. She had 2 with 2 living in 1910 children. In March 1950 Charles and Anna (Kalsow) Schwanke 55th wedding anniversary celebration. Name Variation Carl F. Schwanke was also known as Charles. Carl F. Schwanke was born on 1 November 1901 at Wisconsin. 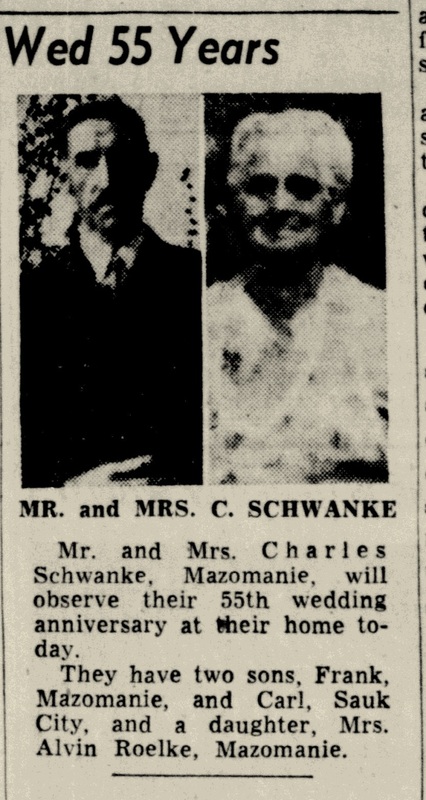 Carl F. Schwanke married Wilma A. Janney on 15 November 1941. 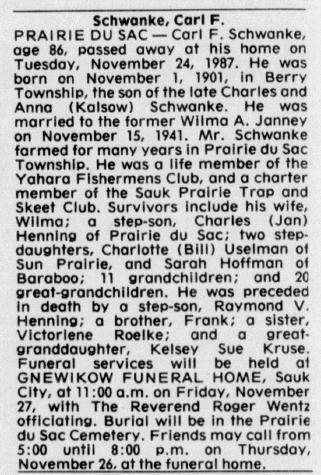 Carl F. Schwanke died on 24 November 1987 at age 86 Carl F Schwanke, 86, obituary. 1 June 1905 Mazomanie, Dane, Wisconsin Carl F. Schwanke appeared on the census of 1 June 1905 in the household of Charles Schwanke at Mazomanie, Dane, Wisconsin. Name Variation Victoriene D. Schwanke was also known as Victorine. Married Name 16 May 1933 As of 16 May 1933,her married name was Roelke. 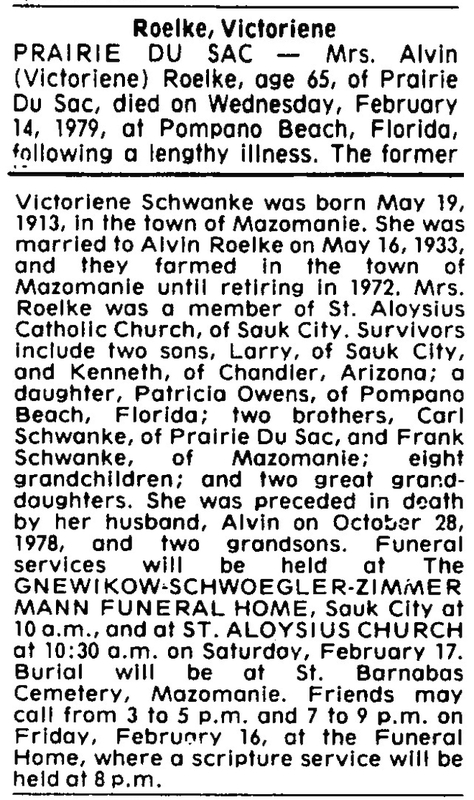 Victoriene D. Schwanke was born on 19 May 1913 at Wisconsin. She was the daughter of Charles Schwanke and Anna Kalsow. Victoriene D. Schwanke married Alvin Roelke on 16 May 1933. 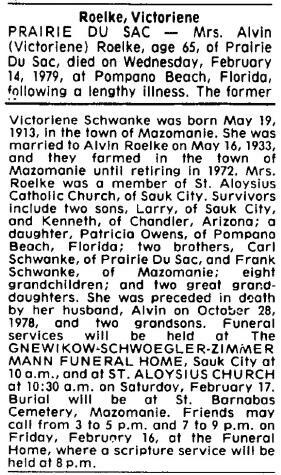 Victoriene D. Schwanke died on 14 February 1979 at Pompano Beach, Florida, at age 65 Victoriene Schwanke Roelke obituary. Name Variation Catherine Lorraine Emery was also known as Katie. 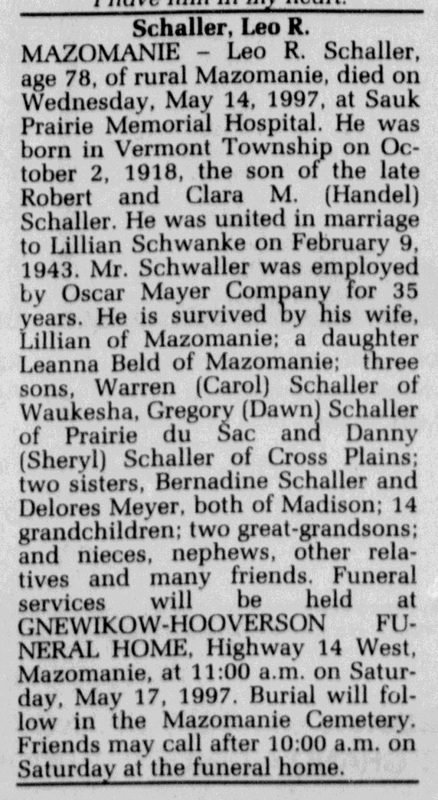 Married Name 18 June 1946 As of 18 June 1946,her married name was Schwanke. Catherine Lorraine Emery was born on 27 May 1928 at Wisconsin. She was the daughter of Dewitt Clinton Emery and Laurelda Marcella (?). Catherine Lorraine Emery married Clinton F. Schwanke, son of Frank Carl Schwanke and Fanny M. Wilkinson, on 18 June 1946. Catherine Lorraine Emery died on 8 April 2010 at age 81 Catherine L. "Katie" Schwanke passed away at HospiceCare in Fitchburg on Thursday, April 8, 2010. She was born May 27, 1928, in Aurora, Taylor County, to Dewitt and Laurelda Emery. Katie married Clint Schwanke on June 18, 1946, in Sauk City. Clint died on June 15, 2007, three days prior to their 61st wedding anniversary. Katie owned Sew-n-Sew in Spring Green for 32 years and was said by many to be the best seamstress in Southwest Wisconsin. Katie served on the Spring Green Village Board for 12 years and taught sewing for MATC and 4-H. She enjoyed sewing, cooking and baking. Survivors include Sandy Neal and Barbara (Brett) Kleppe of Madison, Jeanie (Chuck) Hadden of Sun Prairie, Kathy (Dennis) Muskat of Middleton, and ZoAnn (Isa) Bashir of Nigeria; grandchildren, Mark and Yvette Neal, Angela Bahr, Todd and Rebecca Hanson, Ishmael Bashir, and Ben and Katie Kleppe; stepgrandchildren, Matt, Sarah and Kerry Hadden; seven great-grandchildren; brother, Lee Emery; sisters, Janice Soelle, Joan Pfeiffer, Helen Richards, Viorene Schroeder and Karen Foster; and many other relatives. She was preceded in death by her parents; sister, Marcella Page; son-in-law, Brazie Neal; and other relatives. Services will be held at ST. BERNARD'S CATHOLIC CHURCH, 7450 University Ave., Middleton, at 11 a.m. on Wednesday, April 14, 2010, with Monsignor Douglas Dushack presiding. Visitation will be from 10 a.m. until 11 a.m. at the church on Wednesday. In lieu of flowers, memorials may be made to HospiceCare, 5395 E. Cheryl Parkway, Fitchburg, WI 53711. Brazie Neal died before June 2007. Leo Robert Schaller was born on 2 October 1918 at Wisconsin. He died on 14 May 1997 at age 78 Leo Robert Schaller obituary. Lucille M. Clark was born circa 1913 at Wisconsin. She was the daughter of Earl Clark and Salome Anna LaBounty. Willard Clark was born circa 1917 at Wisconsin. He was the son of Earl Clark and Salome Anna LaBounty. Robert Clark was born circa 1919 at Wisconsin. Marion Clark was born circa 1921 at Wisconsin. Name Variation Helene A. Friis was also known as Helen. Married Name before 1975 As of before 1975,her married name was Severson. 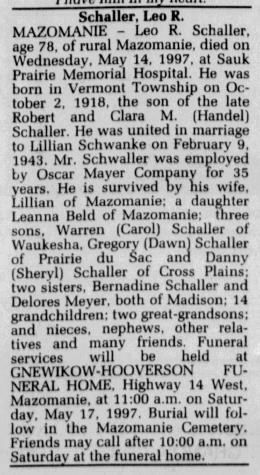 Married Name 15 June 1975 As of 15 June 1975,her married name was Schwanke. Helene A. Friis was born on 4 January 1936 at Dane, Wisconsin. She was the daughter of Paul Andrew Friis and Marguerite Altand. Helene A. Friis died on 22 January 2003 at Dane, Wisconsin, at age 67 Helene A. Schwanke, age 67, of Monona, died on Wednesday, Jan. 22, 2003, at Don and Marilyn Anderson HospiceCare Center, after a brief illness, surrounded by her family. She was born on Jan. 4, 1936, in Stoughton, the daughter of Paul and Marguerite (Altand) Friis. Helene married David Schwanke, her beloved husband of 27 years. She was self-employed for many years in the home cleaning business. She will always he remembered for her love of birds and her beautiful gardens. Helene is survived by her husband, David; her children, Darrell (fiance, Barb), Dorothy (Twoie) Gallagher, Doug Severson, Diane (John) Hanson, and Daniel (Lynn) Severson; and special grandchildren, Tiffanie, Richard, Jon, Tim, Ryan, Justin, Lindsay, Melissa, and Emily. Helene was anticipating the arrival of her newest granddaughter, Lily Helene. She is further survived by great-grandchildren, Amber and Aaron; and many other relatives, including the Schwanke family, friends, and special "cousins." She was preceded in death by her parents; a daughter, Debra Olsen; and two brothers, Paul and Marcel Friis. Funeral services will be held at GUNDERSON EAST FUNERAL HOME, 5203 Monona Drive, at 1:30 p.m. on Saturday, Jan. 25, 2003. The Rev. Arden Laper will preside. Burial will be in McFarland Cemetery. [S373] U.S. Federal Census 1940 U.S. Federal Census, by Ancestry.com, Year: 1940; Census Place: Blooming Grove, Dane, Wisconsin; Roll: T627_4468; Page: 7B; Enumeration District: 13-6. Paul Andrew Friis was born on 18 May 1890 at Veile, Denmark, also reported as Germany. He married Marguerite Altand circa 1919. Paul Andrew Friis died on 5 March 1966 at Wisconsin at age 75. Paul Andrew Friis immigrated in 1912. In 1942 traveling salesman for Harrison Oil Company. [S243] U.S. Federal Census 1920 U.S. Federal Census, by Ancestry.com, Year: 1920;Census Place: Madison Ward 7, Dane, Wisconsin; Roll: T625_1981; Page: 20A; Enumeration District: 55; Image: 864. Name Variation Marguerite Altand was also known as Marguerita. Name Variation Marguerite Altand was also known as Margaret. Married Name circa 1919 As of circa 1919,her married name was Friis. Marguerite Altand was born on 30 September 1900 at France. She married Paul Andrew Friis circa 1919. Marguerite Altand immigrated on 8 June 1919 to Newport News, Virginia. She was naturalized on 15 September 1924 at Circuit Court, Madison, Dane, Wisconsin. Paul Donald Friis was born on 17 May 1921 at Madison, Dane, Wisconsin. He was the son of Paul Andrew Friis and Marguerite Altand. Paul Donald Friis married Ruby May Haak on 8 March 1995 at Dane, Wisconsin. Paul Donald Friis died on 4 April 1995 at Dane, Wisconsin, at age 73.